On March 23, 2019, the Flemish government’s ambitious Moonshot programme was launched by Flemish Minister of Economy and Innovation, Philippe Muyters. The 400-million-euro programme for the next 20 years will help position Flanders as a leader in research and innovation for energy-intensive industries. The programme supports basic research on breakthrough technologies that catalyse the chemical, petrochemistry and steel industries to take on climate challenges and become ‘carbon smart’. Catalisti, as spearhead cluster for innovation in chemistry and plastics, is responsible for the programme’s coordination. Each year for 20 years, Flanders will invest 20 million euros in innovation and basic research projects that demonstrate a tangible contribution to reduced carbon emissions, and the improved capture, storage and utilisation of CO2. This long-term programme aims to leverage the knowledge and technology already present in Flanders’ industry, universities and research centres. Efforts will focus on four closely related research fields: bio-based chemistry, carbon circularity of materials, the transformation of production processes and energy innovation. The programme will help promote Flanders as a top region for research and innovation in energy-intensive industries. “The major innovations that result from the programme can be marketed worldwide, and hence we will be able to contribute to the climate challenges globally. This turns climate challenge into an economic opportunity for Flanders,” comments Philippe Muyters. Over the past decades, the Flemish chemical and life sciences industry has already made huge progress in drastically reducing its carbon emissions. While doubling production, the industry simultaneously cut its greenhouse gas emissions in half. In addition, our industry provides the essential building blocks that enable other sectors, such as energy, construction and transportation, to make their products and processes more sustainable. It thus plays an important role in the transition towards an environmentally friendly industry and society. 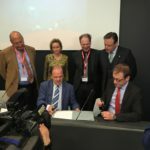 This makes spearhead cluster Catalisti – which supports collaboration between more than 100 chemical and other industrial companies and 5 Flemish universities and leading research centres – the right player to coordinate the Moonshot programme. The programme is also supported by the Flemish chemical and life sciences industry federation essenscia, the Belgian Petrol Federation, the Steel Federation and the federation of Belgian industrial energy consumers Febeliec. Additionally, five other spearhead clusters will be closely involved: Bleu Cluster (maritime projects), Flanders’ FOOD (food), Flux50 (energy), SIM (materials) and VIL (logistics). “We have to actively look for new technologies, products, processes and raw materials. In this context, carbon is not the problem, but the solution, and we have to deal with it in a smarter way. As the home base of the largest and most specialised chemical cluster in Europe, Flanders has all it takes to make this happen,” says Wouter De Geest, president of Catalisti. “I am proud that Catalisti is taking the lead in controlling pioneering research within the Moonshot programme, working in collaboration with research facilities, companies and other spearhead clusters. I am confident that together we will be able to realise crucial breakthroughs and contribute considerably to developing innovative technologies by 2040, thereby enabling the Flemish industry to transition towards a carbon-circular and low-carbon system by 2050,” says Jan Van Havenbergh, Managing Director Catalisti.